Your Photos; Our Photo Album! Show us your stuff and put your photos here! We want to show YOU off! If you'd like to submit photos showing you and your students in action, please send either a regular photograph or an email with the photo file attached. See our Contact page for mailing instructions. Cinderella Operetta was a great success for 36 young performers. 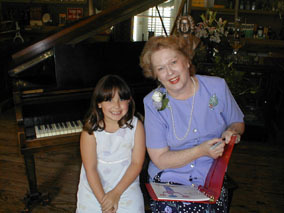 Mrs Cole visits with a spring recital student of Ms Tanys Ulsh. These young ladies completed EZ Keys 1, 2, & 3 in one semester (and Christmas Carols, too!). 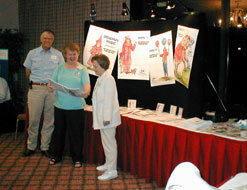 They take group lessons at Instrumental Inspirations in OK.
Mayron, Bill, & a visitor at an international music readiness teacher convention, July 2003. I've intended to send these forever! 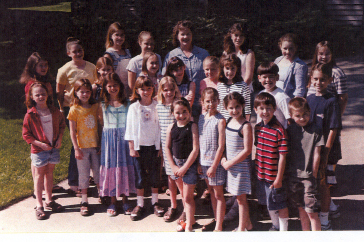 Just thought you'd enjoy seeing the Piano Kids of the Redwood House Music Studio in IA. 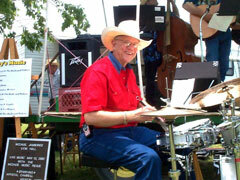 Bill Cole, co-owner of the Mayron Cole Piano Method, enjoys playing at the Blackland Prairie Festival in Lund, TX, May 4, 2002.